A coronagraph is a device which blocks light from the center of the telescope beam while permitting light from surrounding sources to pass through relatively undisturbed. 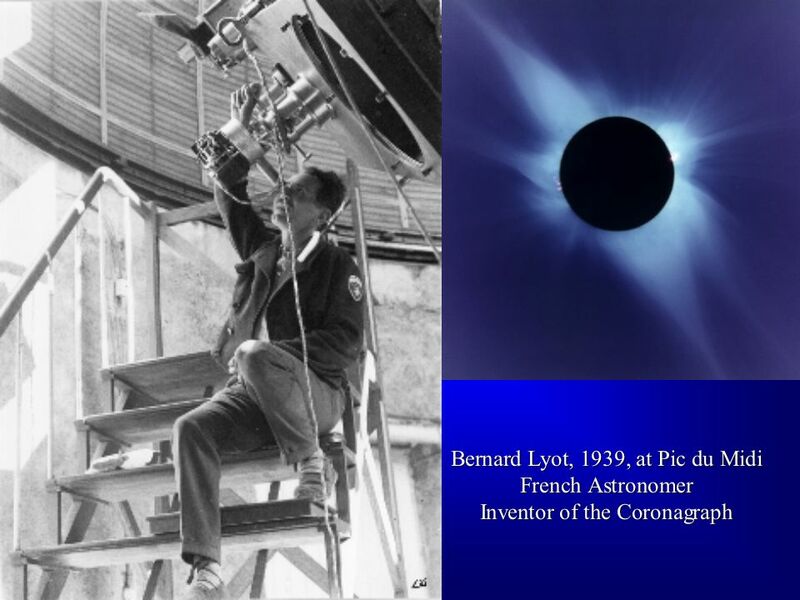 The coronagraph was invented by the French astronomer Bernard Lyot in 1939 (Figure 1), to enable astronomers to observe the hot gas (the corona) surrounding from the Sun without having to wait for total solar eclipses. Although the Lyot Project, named to honor Lyot's work, will use a "stellar coronagraph" to image faint objects surrounding other stars rather than their coronae, the technique is essentially the same. The principles of how a coronagraph works are shown below in Figure 2. Light enters the telescope aperture, or pupil, as an evenly-illuminated source, blocked in this case by the secondary mirror at the center. A lens images the light, and here where a camera or detector would usually record the image, an occulting spot, or focal plane mask, is placed instead. This spot absorbs most of the light from the center of the field of view, so that when the pupil is reimaged by another lens any remaining light from the central source is concentrated around the edges of the telescope pupil - in this case forming rings around the edge of the aperture image and the secondary mirror image. 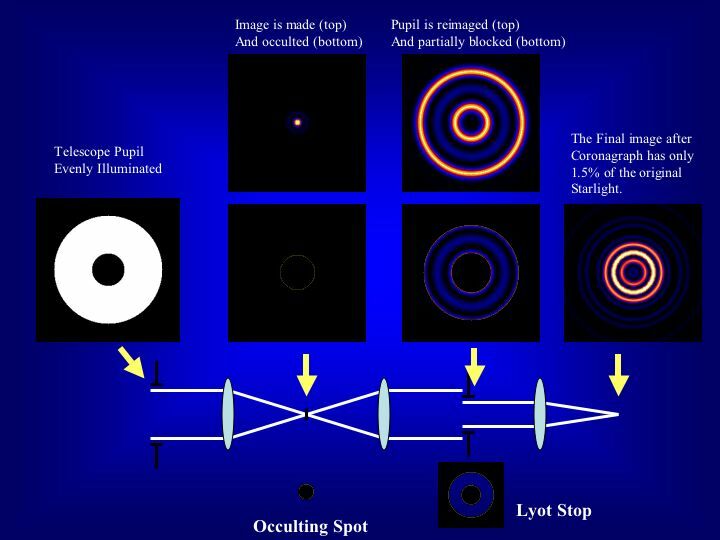 The next stage of the coronagraph is the Lyot stop, which blocks out the remaining rings of light from the central star whilst allowing most of the light from surrounding sources to pass through to the final image, created by a final lens. This technique is ideally suited to studying exoplanets and debris disks around stars, since it greatly increases the contrast in the final image: in an ideal Lyot coronagraph only about 50% of the surrounding (exoplanet) light is removed, compared to nearly 99% of the starlight. Coronagraphy therefore makes seeing extremely dim objects very close to bright nearby stars possible, in an ideal situation, as depicted below. Unfortunately, the incoming light at the telescope pupil is, in practice, disturbed by atmospheric turbulence. Even in spacecraft (such as the Hubble Space Telescope) the light entering the coronagraph will be disrupted by optical imperfections or changes in the optics due to temerature changes over time. These effects substantially degrade the coronagraph's ability to remove the starlight. For this reason adaptive optics are required in order to effectively image exoplanets and debris disks in conjunction with a coronagraph, no matter whether the telescope is in space or on the ground. Figure 2: How a Lyot coronagraph works, adapted from Sivaramakrishnan et al. 2001.